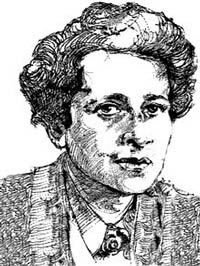 A German-American political theorist, Hannah Arendt (1906-1975) was one of the most influential female philosophers of her day. Her major work deals with the nature of power, the subjects of authority, direct democracy, politics and totalitarianism. Hannah Arendt was born in a middle-class family on October 14, 1906. Both of her parents – Paul and Martha – were of Russian descent. Her father died when Hanna was only seven years old due to paresis. Her mother then married a man named Martin Beerwald who brought two older stepsisters for Hannah. Arendt was a bright child and she was encouraged greatly by her mother in her academic and intellectual pursuits. She was an avid reader from a very young age and by 16, her reading interests included Goethe and Kant. She studied with the most original scholars of that time in a German University. In 1929, Hannah received her doctorate and married Gunther Stern. She held a number of academic positions in various universities until her death in 1975. In 1933, Hannah was arrested for collecting information regarding Nazi anti-Semitism. Shortly after World War II began, Hannah moved to France and worked for a Jewish refugee organization. In 1937, she divorced her husband and by 1940, she married Heinrich Blucher. They were both held captive in southern France, but they fled to New York in 1941. Throughout the years of war, Hannah wrote a political column for Aufbau, a Jewish weekly. She also published a number of journals in leading Jewish journals. Hannah had a wide audience for her writings. Hannah’s first major publication occurred in 1951 with The Origins of Totalitarianism, which argued that modern totalitarianism was a form of government that used terror to control its people. Arendt’s second major work – The Human Condition – was published in 1958. In this work as well her next work published in 1961, Arendt clearly mentioned that humans were not able to get solutions in established traditions of religion, political authority, philosophy, or even common sense. After attending the trial of Adolf Eichmann in 1961, she published her reports first in The New Yorker and then in 1964, as Eichmann in Jerusalem. She claimed in that publication that Eichmann was more like a puppet rather than evil, an idea that spoiled her reputation with even some of her good friends. Arendt’s second publication earned her very good academic reputation which led her to a visiting appointment at Princeton University. Her brilliant lectures at the University of Chicago and in the New School of Social Research inspired a number of students in philosophy, political thoughts, history, and religious thoughts. During late 1960s, Hannah engaged herself in a number of projects like essays on current political problems to war and civil unrest, two-volume edition of Karl Jaspers’ The Great Philosophers, and portraits of men and women who gave some details on the dark times of the 20th century. During 1973 and 1974, Arendt delivered Gifford lectures in Scotland. Before completing these lectures, however, Hannah died of a heart attack. Later, her lectures were published in 1979 as the The Life of the Mind.